Which Website Design Software Is the Right One for Me? Building a website is supposed to be easy, right? It can be, if you choose the right software for your skills and needs. However, with so much website design software to choose from, it’s hard to make a choice. Let’s take a look at some basic information to help you choose your ideal design software. How much time do you have to learn new software and design your site? If you’re aiming for a launch deadline, then you may not have tons of time. Some software programs have a steep learning curve. Others are intuitive and easy to use. Be realistic about the skills and knowledge you already possess and the time you have. What is the purpose of your website? What do you need it to accomplish and provide? If you’re creating a very advanced site with a lot of bells and whistles, then you may want an advanced program to create it. However, if you’re creating a basic site, for example a theme-based site, then you may not need a professional software program. A simple site builder wizard may do the trick. Website design software ranges from free to thousands of dollars. Be realistic about your budget. If you’re building a website as part of a business, then be realistic about your return on investment as well. If you can recoup the cost of the software in six months to a year, then it’s likely worth the expense. Some website design software is fully capable of integrating with a number of add-ons. For example, you can use your software to design your site and then add on a second party shopping cart application. Other software programs don’t integrate well with much. What you see is what you get. Before purchasing website design software, create a plan. Plan what you want your website to be able to accomplish now. What features do you need? Also plan for the future. How are you going to grow? What features and technologies might you need in the future? Think ahead. Of course you’re not going to be able to predict the future a hundred percent, so also pay attention to #5 below. Ideally you want your website design software to be supported tomorrow and ten years from now. If you purchase software and they go bankrupt next week, there won’t be any developers working on maintaining and improving the program. However, if you purchase from a reliable company that’s been around for a while, you can be fairly certain you’re protected. You can also be fairly certain their developers will continue to grow and adapt the software to fit the demands of new technology. If you’ve looked at all of the considerations and still aren’t sure how to compare, speak to other website owners. What software did they use? What did they like about it? What did they dislike about it? This is particularly helpful if they've built a site that’s similar to yours in purpose and function. There are site builders for every type of business model and purpose. For example, membership sites, e-commerce sites and of course theme-based sites. Find the software that fits your site’s purpose and your needs and go from there. To your success! Website versus Blog – Or Do I Need Both? Creating a website for a new business? If so, you may be wondering which is the best choice – website or blog. The answer isn’t as difficult as you may think. Here’s how to make the right choice for you and your business goals. Yes, both websites and blogs, particularly a WordPress blog, can support just about any type of business model. WordPress developers have created plug-ins that can turn any WordPress blog into an e-commerce site, a membership site and more. However, these plug-ins and add-ons can be more of a hassle than it’s worth. And finding the right plug-in may be a trial and error process. If your business model relies on the publishing of timely information, then a blog is likely better. However, if your business is meant to sell a product or service, then a website may be a better choice. How much time do you have to devote to the upkeep and maintenance of your business? A blog still relies on consistently publishing content. Despite contrary “rules” about blogging, you don’t have to blog every day or several times a day. However, people who subscribe to blogs do expect regular installments of new content. You can schedule your posts. However, it does require a bit more maintenance on your end. A website can be left alone for a month or two without any issues. Some of your decision will be based on your personality. What format do you prefer to use? A blog is very easy to update and utilize. You may need help to find, install and set up the right plug-ins. You may also need help customizing a theme or adding a custom header. However, by and large blogs are very easy to use. Websites can be trickier for some. That being said, many website developers and design software make the user interface quite simple. You can modify pages and add content without needing to learn or understand a design language. Quite often a blog and a website work well together. A website sells. A blog drives traffic and brands the business. A blog can speak to a niche within your niche. For example, General Motors has a main website. They also have a blog that is basically car talk. It’s for car enthusiasts and its run by a head honcho at GM. He loves cars. The blog helps brand General Motors and it connects prospects and customers to the business. It builds a community. Before you make a decision about whether a blog or a website is right for you, consider these points. What’s the purpose of your site? What will offer the best customer experience? What will be easiest for you to use and maintain? Finally, what will best help you achieve your goals? To your success! When you’re creating a website there are a number of decisions to make. In addition to your budget and the creation process, there are features and functions to weight. There are so many fantastic technologies and options that the process can feel overwhelming! Does your website niche fit better with video content or print content? How are you going to connect with your prospects, visitors and customers? Your site's design needs to support your audience and their needs and desires. Also take a look at the various technologies that can support your site and its purpose. Some website design services offer seamless integration. Keep your visitors’ experience at the heart of every decision and you won’t go wrong. Did you know that simply changing the color of your copy can change your conversions and sales? It’s true. Color has the power to affect our emotions. This means choosing the colors for your website is not a black-and-white decision. * PURPLE - Purple stands for passion. It’s also commonly used to represent royalty, luxury and fantasy. Do the colors on your website presently support the image you want to portray? Do they have the desired effect on your prospects and visitors? If you’re unsure, consider making minor changes and testing and tracking results. Test the color of your headline. Test the color of your background. Test the color of your forms too. Color has a dramatic effect on emotions. It can motivate, inspire, and touch. Take advantage of the effect color has and use it on your site to help you achieve your goals. If you own a website you are likely looking for any advantage over your competition. RSS feeds may be the advantage you’re looking for. Here’s how to incorporate them into your website. An RSS feed is simply a type of program that publishes any updates on your website. RSS stands for Really Simple Syndication. It’s a type of feed format. The primary benefit of an RSS Feed is that your customers and prospects are instantly notified whenever you publish new content. You’ll stay front of mind with your customers. They receive the benefit of having your information delivered to their email inbox or reader. A simple RSS feed can help you connect with your customers and prospects on regular basis. It helps you build a community and keep them informed and connected. You can also use an RSS Feed to provide information about your industry from other websites. For example, if you’re a website that focuses on a financial investing niche, it might provide value to your visitors to see an RSS feed that’s focused on the latest financial news. The information is presented right on your website for all visitors to benefit from. The process of adding RSS to your website varies depending on your website platform. For example, if your website is built on a WordPress template then you likely already have RSS features and functions. You simply have to activate them and modify the settings to fit your needs. On the other hand, if you have a Joomla or other CMS based website then you may want to register with a feed management service like FeedBurner (FYI – Google now owns FeedBurner). Register, provide the necessary information, and create your code. You’ll simply cut and paste the code into your page’s html and you’re good to go. Note that some website platforms like Joomla also have plug-ins that handle this task for you. They create a nice “RSS Feed” button and place it in an obvious and strategic location. You can generally choose the button’s appearance and the location of the subscribe option on your website. Other website design software programs may not accept RSS technology so easily. Investigate your website platform and the possibilities. RSS technology provides a number of benefits to your readers and to your bottom line. Investigate the possibilities today. Is your website lacking a “cool” factor? It’s important to keep up with trends and technology. Visitors make a snap judgment when they visit your site. If it looks old and dated, it may discredit you. Here’s how to design a modern and cool-looking website to stay current and credible. #1 When was the last time you updated your site? This is the first and most basic question. If it was more than a year ago, chances are you’re missing out. New technologies and website features are developed on a regular basis. You certainly don’t have to take advantage of all of them. However, you can freshen up and modernize your website at least once a year. #2 What features and functions do your prospects use? Social networking is an easy example. Just about everyone from the age of twelve on up is using some social networking site. Facebook, Twitter, LinkedIn and MySpace are just a few examples. If your audience is using these, then adding them to your site makes sense. It’ll help keep it up to date. It’ll also provide a connection to your audience. #3 What can you add or modify to enhance the experience? Elements shouldn’t be added to your site just because they’re cool or cutting edge. They need to support your overall goals and purpose. Take a look at the technology offered today and how it might support your business. Explore how it might add value to your customers. * Do you use video on your site? Video is a growing trend and one that many prospects respond to. * Are your prospects active on social networking sites? How can you add this behavior to your business model to add value? * Can you take advantage of your prospects and visitors to add content to your site? * Would a blog help you build or support your brand? * Can social bookmarking build your traffic and SEO? #4 Are your graphics, images, and colors out of date? It’s important that your entire site create a comprehensive image. This image should support your brand. Making huge changes to the overall look and appearance of your site can have a detrimental effect. However, you can update the look of your site and still retain your existing brand image. For example, you can have a complete overhaul of your website navigation and retain your header graphics, logo and font. Small changes can make a big difference. A simple adjustment of your font to a new and more modern-looking font can add “edge” and “cool” appeal to your site. If you haven’t updated your site in a while, take a look at how you can improve it. Base your considerations on your user’s experience. Make sure each change you make supports your customer and/or your business goals. To your success! You want every single website visitor to have a positive experience on your website. In order to make that happen it has to be accessible by everyone. Here are seven easy strategies to make your website accessible. 1. CAPTCHA - If you use a CAPTCHA to verify that a user is a person and not a computer or a program, you may be eliminating some folks from a user experience. Those who cannot read the CAPTCHA code may be unable to enter it correctly. Thus they won’t have access to the information. You can add an audio element to your CAPTCHA so visitors can hear the code and then successfully type it into their computer. You receive verification. They receive access. Win/win! 2. Tagging photos - If your images don’t load properly or a user has them blocked, they’re missing out on part of your website. If you simply add an alt tag to your images, then everyone is able to experience your website fully. An alt tag tells your visitors what the image is if it cannot be displayed or viewed. The Americans with Disabilities Act dictates that all images must have an alt tag. 3. Small files and quick download/upload times - Large graphics and files slow a user’s ability to upload your website. Their system may simply not be able to access your site. If you have large files you're therefore making your site inaccessible to many. Make sure your website images, files and graphics are all as small as they can be. Quick upload times are appreciated by all. 4. Standard files - Make sure any content published or available on your website is available in a readily accessible format. For example, PDF documents are easily viewed by any system. MS Word files or WordPerfect files are not. 5. Accessible navigation - Make sure each button, category, or action step is easy to find and understand. The more straightforward your website navigation, the easier it will be for each and every visitor to access your site’s pages. 6. Label all form input elements - If you have a form for visitors to fill out, make sure each element of your form is labeled. This will ensure your visitors know what information is supposed to go into the form. 7. Make links obvious - If you have links for visitors to click on, make sure they are obvious. Text links, embedded or otherwise, all need to stand out from the rest of the content. Consider bold, underlined or colored formatting to set them apart. The more accessible your website, the better your user’s experience. Make sure each and every visitor, regardless of their ability or technology, can experience all your site has to offer. 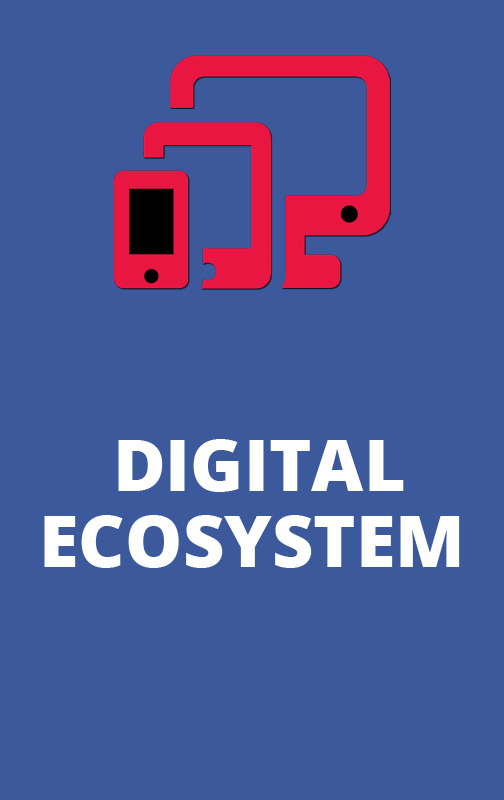 What is Hasloo Digital Ecosystem? © Hasloo Digital Ecosystem .